Trust took years to develop. It could be eroded by a change in personnel or circumstance, but over time it was vital for the success of the projects. The Business Trust carried out its work by building partnerships and encouraging a cooperative approach to the pursuit of South Africa’s development objectives. The idea was that relationships could be built and trust enhanced by working together through the Business Trust and its projects, sharing perspectives on strategic issues, and communicating the value of partnership. This approach was developed in the context of a world characterised by eroding trust and a country historically defined by division. South Africa’s democratic government was facing escalating demands and business wanted to show its commitment to the new democracy. There were few channels of engagement between a business community searching for new forms of organisation and a government cautious about engaging with business. • share the experience and the results of working together in a manner that would encourage a cooperative approach to addressing South Africa’s development challenges. By the end of the programme an extensive range of partnerships had been built. The Big Business Working Group facilitated dialogue between business and government at a time when it was the only avenue for such engagement. The results of working together were conveyed to the main stakeholders while underscoring the commitment of business to South Africa and the value of a cooperative approach to the country’s development. The partnerships were strongest where there was leadership with a vision of the state that included social partners as co-creators of strategy and partners in implementation. The companies agreed to work together through the Business Trust. They were bound by a vision of South Africa as a stable, prosperous country in which business is a trusted social partner, by the strategies they agreed to support, the formula on which funding was based, and by their undertakings to fund the Business Trust. Members were appointed by the President and the companies that funded the organisation. Over the life of the organisation, 25 cabinet ministers, deputy minsters and senior officials served on the board with the 49 corporate chairpersons or chief executives representing most of the major companies in South Africa. • Cooperation agreements were signed with the responsible government departments setting out the terms on which projects would be undertaken. • Partnership committees were established to guide the implementation of the major projects. These were typically chaired by the minister responsible for the area of operation in which the partnership worked or by senior business leaders. 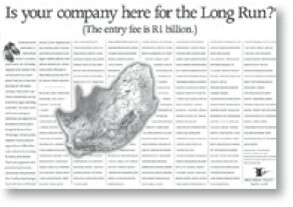 • In some cases business and government leaders participated in project governing bodies, such as in the case of SA Tourism and the Tourism Enterprise Partnership. • Service partnerships were set up between the Business Trust and service providers for the delivery of projects. • Implementation partnerships were established at the level of local schools, municipalities, courts, businesses, training agencies and local communities. Its purpose was to provide business and government leaders with the opportunity to exchange opinions on a range of national issues. These opinions did not seek to represent the mandated positions of business or any of its representative bodies. Neither did they purport to be expert opinions. The Big Business Working Group sought expert advice when necessary and shared its opinions with other business organisations. The purpose of these engagements was not to negotiate agreements, but rather to develop a shared appreciation of the issues, to strengthen relationships, and enhance trust. Over the life of the organisation, 25 cabinet ministers, deputy ministers and senior officials served on the board with the 49 corporate chairpersons or chief executives representing most of the major companies in South Africa. The Long Run was staged six times. Over 5 000 runners from business and government crossed the country in relay teams covering some 9 700 km in the world’s longest corporate relay. In addition the Business Trust published quarterly reports, annual reports, case studies and electronic bulletins. Annual report-back meetings were held as well as project briefings. A website was maintained for the Business Trust and websites developed for the Expanded Public Works Support Programme, Tourism Enterprise Programme, Business Process Outsourcing Programme and the Infrastructure Programme. A database of 4 000 people received consistent communication on the work of the organisation. External evaluations were undertaken of all major programmes, case studies were produced, surveys undertaken, and a series of leadership dialogues held. • at the operating level where the partners shared responsibility for results. • In the absence of formal channels for engagement, the Big Business Working group filled a void. • Covering a wide range of issues with different leaders participating at different times, it had limited potential to build a sustained engagement on critical issues. By choosing to work together, individuals and organisations gave up the roles of heroes and villains. • Care was needed to nurture the partnership and acknowledge the partners’ roles and contribution. • The Long Run provided a useful device for sharing the story. Trust often took years to develop at the project level. It could be eroded by a change in personnel or circumstance, but over time it was vital for the success of the projects.